We’ve had backyard chickens in Seattle for more than a decade now. I kind of like to think that we had city chickens before having city chickens was a thing. (Now everyone has chickens here; you have to get backyard goats to have any urban farming cred. J says we’re not getting goats.) I’m sure Seattle has a home and garden tour somewhere, but I’m also sure that it’s nowhere near as popular as the city’s annual Chicken Coop Tour. At the moment we have just three hens: Ducky, Feather, and Feather. Lately one of the Feathers has been acting upon a likely-well-intentioned but completely misguided plan to hatch a nestfull of eggs, except that we kept taking her eggs away and, ahem, with no rooster in flock the eggs had exactly zero chance of hatching anyway. Feather was petulant about the situation and hunkered down in one of the nesting boxes for weeks. She would not be stirred, unless I would let her into the garden to eat my tomatoes, in which case she happily abandoned her maternal duties and left the nest for hours at a time. Luckily Feather has abandoned her dreams of motherhood and we are getting a few eggs again (broody hens don’t lay). 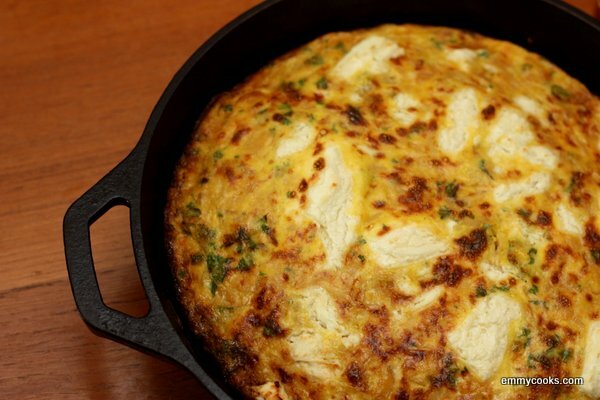 Let us celebrate with a frittata. This entry was posted in Breakfast, Eggs, Food, Recipes, Uncategorized and tagged breakfast for dinner, breakfast or dinner, caramelized onions, chickens, eggs, frittata, onion recipe, vegetarian recipe on September 22, 2012 by emmycooks. There are currently only three chickens in our backyard flock: Ducky, Feather, and Feather. Yes, two Feathers, both black. I’ll gloss over the details of what happened to the original black Feather, and just tell you that when we got chicks the following spring, my oldest exclaimed in delight: “This time we have two Feathers!” And so we do. The Girls (by which, at the moment, I mean the three chickens, not the three little girls who live inside with us; it does get confusing sometimes) usually keep us amply supplied with eggs. Today we had run out, though, so I was pleased that an afternoon visit to the coop yielded the two eggs I needed to make this recipe. Taking fresh-laid eggs straight to the table never gets old for me. 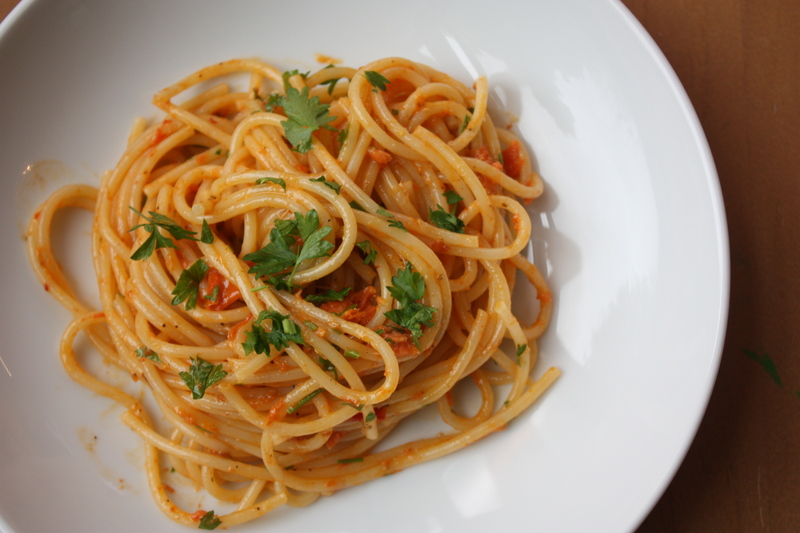 This entry was posted in Eggs, Fish, Food, Noodles, Recipes and tagged carbonara, chickens, lifestyle, mama lil's, smoked salmon, spicy peppers on June 17, 2012 by emmycooks.